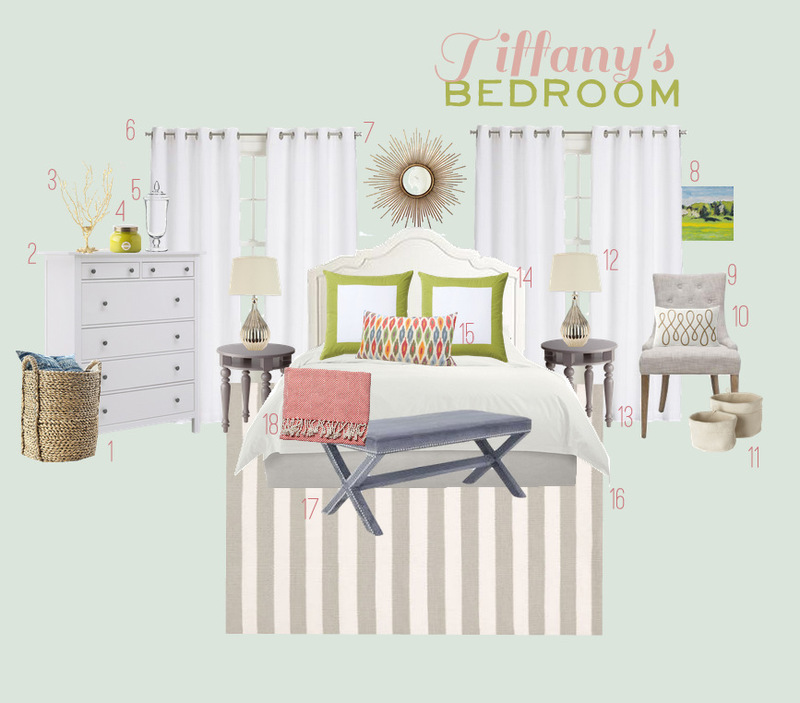 A few months ago, Tiffany e-mailed me and asked for some design help via one of my custom room boards. When Tiffany e-mailed me to ask for help she said, "Basically, I really hate the shape of the room. It's just a long rectangle. The bedroom door opens right in the middle of the room. Our bed is a Cal King, which gives us a really narrow space on either side of the bed. Also, I can't decide what color palette to go with. I don't want anything overly girly, since it's a room I share with my husband, but I DEFINITELY don't want it to be masculine either. I really love traditional, classic rooms with a contemporary twist." Her room started like this. After e-mailing back and forth and talking about what she liked, I created a custom room board for her. I won't share the sources here to be fair to my client but here's the room board I designed for her. I also encouraged her to shift the layout of the room to allow the bed to be facing the other direction so she'd have more room on either side. I think that made a big difference! "The layout of the room is so much better. I actually purchased the Overstock chair you suggested, but then I found this amazing chair at Restoration Hardware and put it in our bedroom and the other in our guest room. Also, you can see the x bench in front of the big window. The room is too narrow to put at the foot of the bed, but it works pretty well over there. Instead of buying new nightstands, I took my IKEA hacks from my guest room and I think they look pretty good in our room now. The room really feels like a different, more open and airy space. I love it so much. Thanks for all your help!" The purpose of a room board is to provide some help and guidance in styling your room. I suggest options and resources for where to buy them but sometimes you may find something that you like better or that's a better price at a local store or something - good on ya! :) I'm pleased with the way Tiffany's bedroom turned out and glad that she liked it. If you're interested in a custom room board here's some more information. P.S. This isn't a design blog and I don't intend it to be but I was happy to see some of my work put into action and wanted to share it. Thanks for indulging me! Wow! I can´t believe it´s the same room. Amazing job, it looks great! That looks terrific. It went from cramped and dark to airy and bright. Love it! HOLY CRAP!!! That really is amazing. Love that pillow on the side chair...and I might have to start looking for a fluffy tufted headboard...like today. Looks so cozy! Get it girl! As an interior designer I really like the solutions you provided for your client. I think it is amazing how much bigger the room looks with the new and improved layout. Well done you! You did a great job Elizabeth! I love the changes she made, it looks like a completely different space.